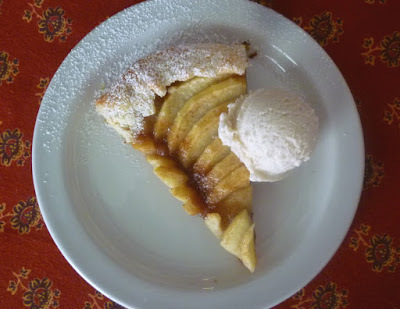 The first time I tasted a fresh fruit crostata (sometimes called a galette or a free-form tart) was when I was a cook at The American Restaurant. A chef named Frank Stitt was there as part of a guest chef series. 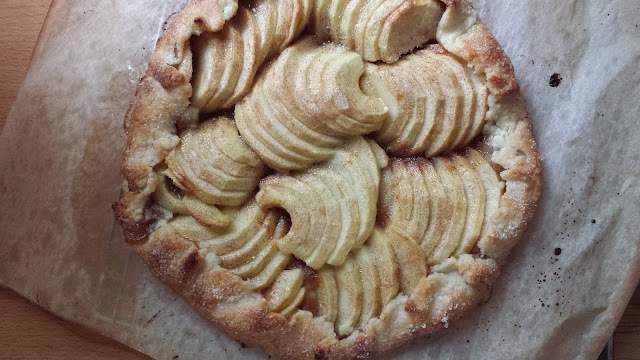 His menu included an Apple Crostata. It was nothing more than a sweet pastry crust smeared with homemade apple butter and folded casually up and around Golden Delicious apples that had been dusted with a bit of cinnamon sugar....and to me it was a revelation in simplicity: It tasted exactly of what it was—sweet, fragrant apples enveloped in one of the most tender crusts I had ever had.... I was hooked for life. Using Chef Stitt's crust recipe, and his method of reinforcing the flavor of a fresh seasonal fruit by lining the crust with a butter/jam/preserve made out of the same (or a complimentary) fruit, I have been making fresh fruit crostatas ever since. While I was working in Provence I made one with the figs that grew on the property where I was staying. The fig jam I used was made from fruit from the early season crop of figs off of the same trees. Every year when prune plums are in season I make a crostata filled with prune plums and damson jam. To me crostatas (along with crisps) are the ultimate seasonal desserts. If you keep rounds of the dough in your freezer, you can make an impromptu crostata with whatever fruit is abundant and at its best any time you want. 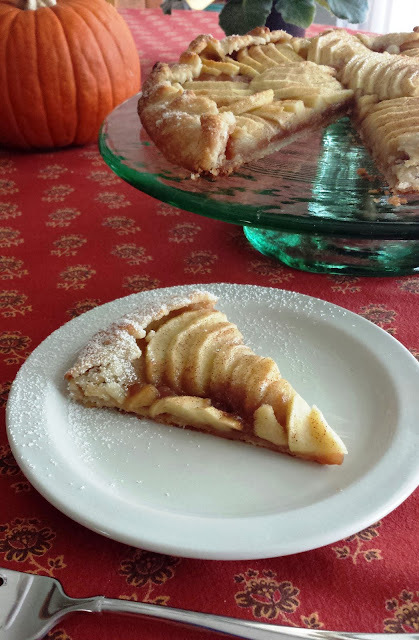 As it turns out, the apple crostata is the easiest one of all to make. Most fruits produce a lot of juices when they are cooked. 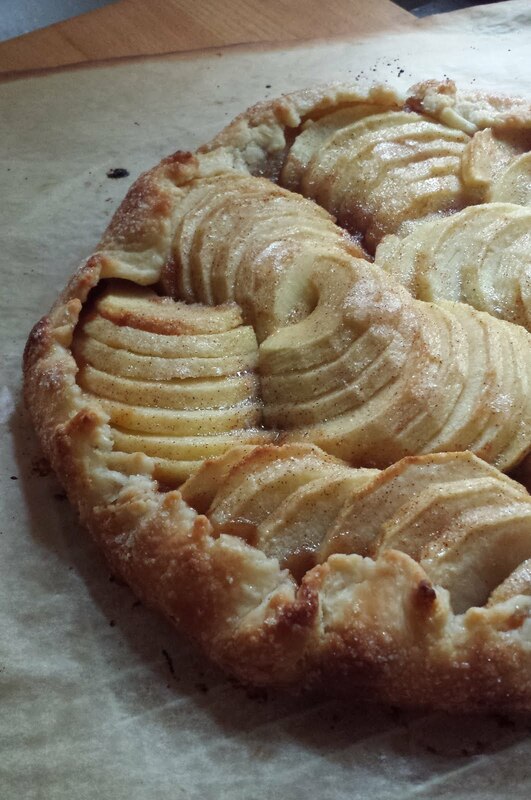 The Golden Delicious apples used in this crostata do not, so you don't even need to add any thickener (flour or cornstarch). Golden Delicious apples are also sweet in their natural state...so they don't need a lot of sugar. The sugar in the apple butter...and a generous sprinkle over the top...is all that is required. But if you like more sweetness, you can up the ante sufficiently with the addition of a crumble topping. 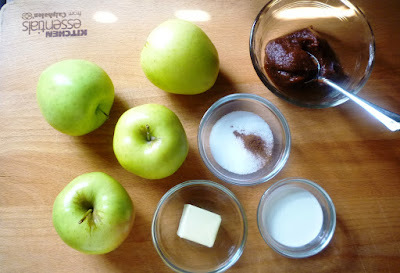 (Adding sugar by tossing the apples with even a small amount would draw out the juices...and add the necessity of a small amount of thickener). I was very pleased with the way this crostata turned out. It was fast and easy to make—perfectly in keeping with the carefree, spur-of-the-moment feel of a free-form, rustic tart. But at the same time, I found it to be spectacularly beautiful....just the thing for whatever kind of entertaining that your fall plans might include. On a lightly floured board, roll dough into a 12 to 13-inch round about 1/8” thick. Transfer the dough to a parchment-lined cookie sheet. Chill the crust for at least a half hour. Combine the sugar and cinnamon and set aside. 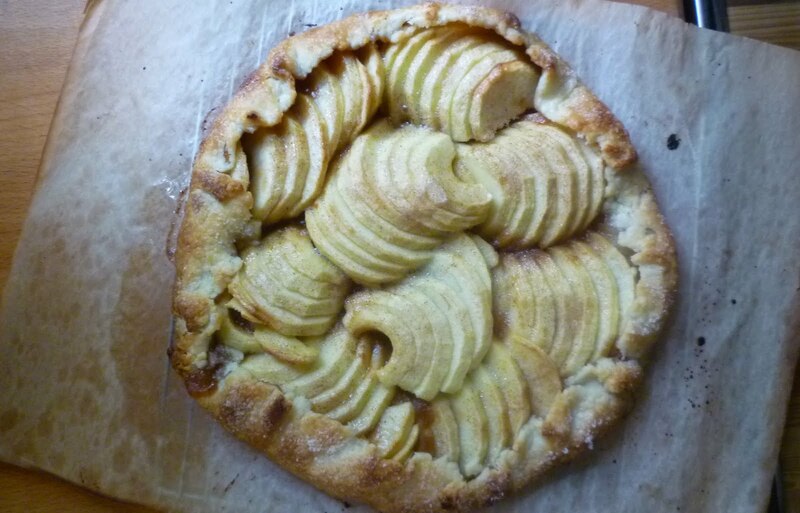 When ready to make the crostata, peel and core the apples. Halve lengthwise. Lay each half cut side down on the cutting board and slice thickly (1/4- to 1/3-inch) crosswise, holding the knife at a slight angle and keeping the slices together so the apple halves are still intact. 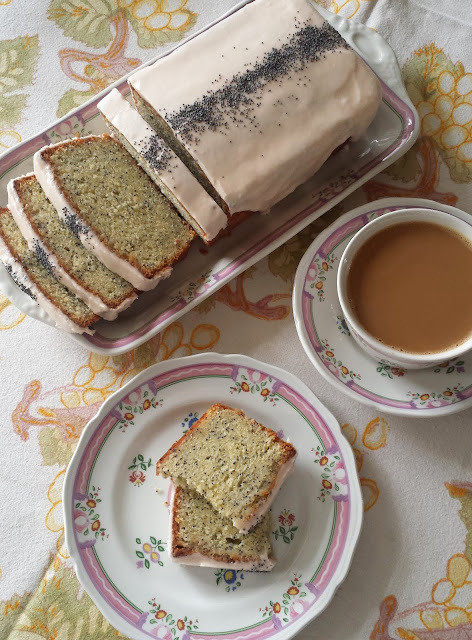 Take the crust out of the refrigerator, leaving it on its parchment lined sheet (you will not be able to move the tart once you have assembled it). Spread the apple butter in a thin layer in the center of the circle of dough, leaving a 2-inch border all around. Arrange the apples snuggly and attractively, fanning them slightly and tucking smaller slices in here and there as necessary to achieve a mosaic of tightly packed, overlapping, sliced apples. and sprinkle the cinnamon sugar evenly over all. Fold the edge of the dough up onto the fruit, pleating it attractively and pressing lightly as you go. Brush the edges of the crust with milk and sprinkle with sugar. Bake the tart at 450º for 20 to 25 minutes—until the crust is golden and cooked on the bottom. Let cool at least 20 minutes. 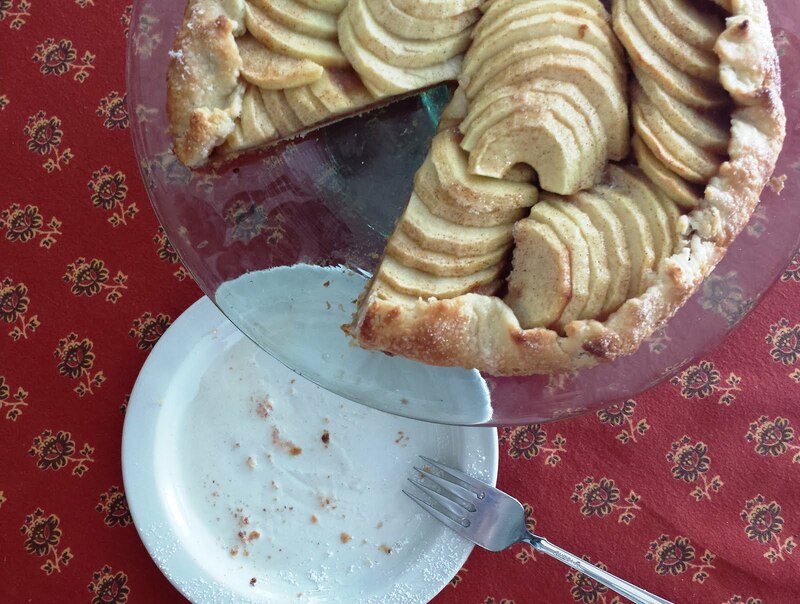 The tart is best eaten the day that it is baked. 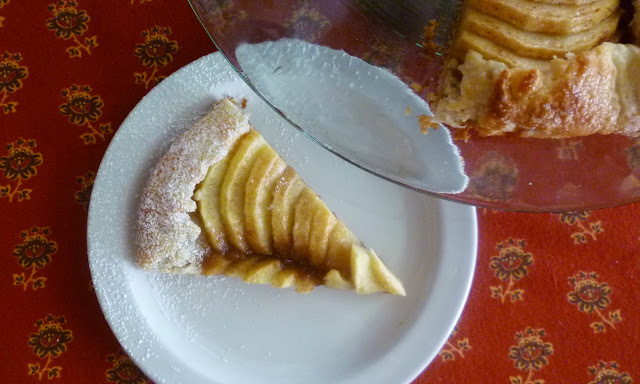 I have always used Golden Delicious apples for this tart. If these are not available to you...or you don't care for them...you may substitute any apple that holds its shape when cooked and has a naturally sweet taste (Granny Smiths, for example, would be a very poor choice since they collapse when they are cooked and they are very tart). If you have a baking stone and your oven doesn't have strong bottom heat, preheat the oven with the baking stone and place the sheet pan with the tart directly onto the stone for baking. Combine the flour, sugar and the salt in a medium-sized bowl. Add the butter and rub into the flour mixture until some of the butter is in small pea-sized pieces and the rest of the mixture looks like cornmeal. (If you prefer, you may rub the butter into the dry ingredients using the food processor, but I think the texture of the final crust is better when this is done by hand. Turn the dry ingredient/butter mixture into a bowl before continuing.) Drizzle 2 T. ice water over the flour/butter mixture. Using your hands, fluff the mixture a time or two. Drizzle the remaining 2 tablespoons of water over the dough and continue to fluff until the dough begins to clump—you should not need any more water. Divide the clumps into two equal portions and turn each portion onto a piece of plastic wrap and press it into a thick disk. Chill for 1 hour. Makes enough for 2 free-form tarts (galette/crostata). Combine flour, sugar and salt. Add the butter. Using your fingers, rub the butter into the dry ingredients until the mixture appears crumbly & is homogeneous. Stir in the oats or nuts. Use immediately, or chill. 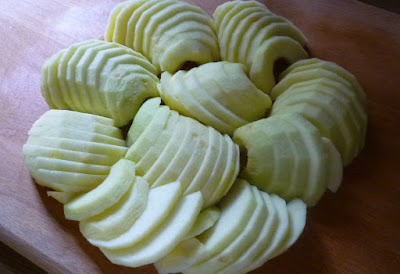 When building the tart, cut the apples into 8 wedges and cut the wedges crosswise into 3 chunks. Pile the apple chunks on top of the apple butter in a jumbled, but relatively even, layer. Cover the apples with the streusel and fold up the edges as directed in the original recipe. Bake and cool as directed for the style without streusel. Classic deliciousness!!! Yours is beautiful, Paige!